Following is an excellent Challenger marketing example from TaylorMade, that takes the conventional wisdom and turns it on its head. Of course, this is requisite for disrupting the status quo. I’d be remiss in not calling out Corporate Visions who first brought this example to my attention in their post titled A story “TaylorMade” to win. Following is an excerpt from his book on the 10 Principles of Personal Leadership that I thought would benefit those looking to improve their own leadership. [Download printable PDF versions of The 10 Principles of Personal Leadership (annotated) and the Checklist for Individuals, Leaders, and Coaches]. The team works hard, and subsequently believed that they were giving their best in one specific area of their performance. Despite their belief, they were stuck in familiar patterns and routines that needed to be reframed, or seen differently. Following is a quick exercise that we did to break open their thinking to get different results. By the way, we have seen a 50% improvement for several weeks straight, due to new thinking, focused efforts and solid coaching from their sales leader. We began by framing our discussion around how giving our best feels like our best, but limits the options to truly give a breakthrough performance. We then voted for a volunteer – the criteria this particular day was for the most athletic person – but you can choose any criteria for this exercise. Brian truly is an athletic individual, and his result was remarkable. 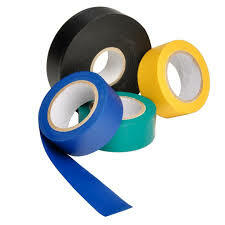 At approximately 10′ high on the wall stood a lone piece of tape. I asked how he felt with his effort. He said, “Good!” I then asked if he had truly given his best effort. He confirmed he had. We debriefed the exercise together as a team, which led them to even better insights than what I had planned for them. 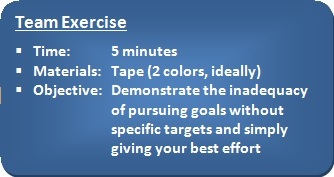 I won’t pass those along so as not to predetermine how this exercise can and should be used with your teams. In short, what we saw was Brian adjust his whole approach to beating his best. If you choose to do this exercise with your team, I would love to hear the results your team’s experience. Have you ever experienced planting your lawn by seed rather than laying sod? Without visible signs of growth, you are left with doubt…that is, unless you know what to expect! We have become more of a ‘sod culture’ in which one minute we have dirt, the next, green grass. We love the simplicity of processes like ‘First, lay sod with green-side up, then water daily until lawn is established.’ Easy! For the experienced lawn professional, whether laying sod or seeding, they understand that the most important step is in the preparation of the soil. Once seeds have been appropriately planted, the lawn pro is not distracted nor deterred by lack of initial growth above the soil. That is not expected at this stage. The professional recognizes the most critical growth is that which is unseen…below the surface. Therefore, they are committed to the right process and follow a certain choreography, which allows the roots to be established and eventually leads to a beautiful, lush lawn. 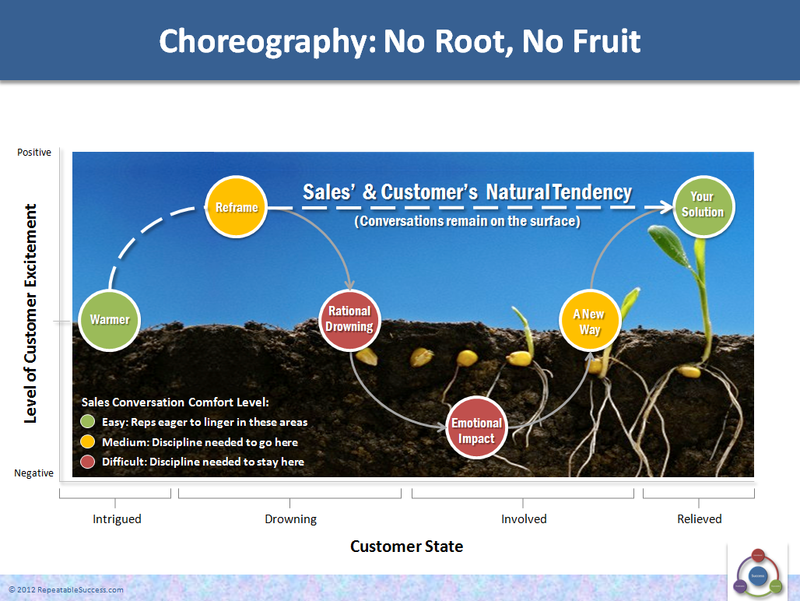 When it comes to sales professionals, there often times is a lack of commitment to follow the choreography, which intentionally penetrates the surface to establish roots, resulting in break-through growth. The Challenger Sale choreography aims squarely at doing this, getting well beneath the surface from the Reframe straight down through Emotional Impact. Not so for the Relationship Seller as their interpretation of the Challenger choreography treats the Warmer as bonding and rapport, which leads to their Solution as the rapport builds. For these reps, their natural tendency will be to keep conversations at or above the surface as if to maintain a conversational stasis or equilibrium. Another common [but highly ineffective] approach reps use to maintain this pleasant equilibrium is to introduce the product or solution immediately into the conversation. Prospects are often quick to get to product as well, especially when the reason for your call to them stemmed from a lead. A couple of years ago, I was brought in to improve a team’s ineffectiveness with conversions. I did a time study to evaluate how soon into the call they brought up their own solution. 83% of their calls introduced their solution within a minute or less of the prospect answering the phone. 14% of the calls had solutions introduced within 2 minutes of answer. The remaining 3% were generally customer service calls. While the problem above may seem severe, it is not unique to this team. In fact, a cursory review of some of today’s most popular sales forums reinforces how often this does happen. Therefore, to help sales and marketing teams better understand the problem, I created the visual above based upon CEB’s framework for The Challenger Sale Choreography. This visually illustrates the foolishness of expecting the growth seen at the Solution stage, despite skipping over the Reframe through Emotional Impact where the seeds are just beginning their growth. By overshooting this and going straight to solution, the rep has significantly lowered [if not eliminated] their chance of conversion apart from luck. For the Sales Leaders or Reps that are already familiar with The Challenger Sale, this is a reminder to stay committed and disciplined to the well-defined choreography that CEB’s research turned up. There has been a lot of talk about Challenger selling, with repeated points made that The Challenger Sale has equally as much to do with Marketing as it does with Sales. Following is an example from Group after trying the Challenger approach in its marketing messaging on a direct mail piece. In interviewing the marketing team, they shared that the aim was to disrupt the status quo for women’s ministry directors doing retreats the same old way that they have done for years. To be more specific the status quo for directors was to hire an inspirational keynote speaker for the weekend in order to help enable more women to connect with one another and carry on in weekly women’s bible studies and groups. The problem was that women would come away from the retreats inspired, but still not connected to a larger body of women in their church. Group Publishing recognized that while their customer’s (Women’s Ministry Directors) chief aim was to create connections between multi-generational women, the churches current method of doing a ‘speaker-based’ retreat actually created the problem, instead of solving the problem of women connecting. Why? Consider the room setup when you go to hear a keynote speaker. Which way are the chairs facing? They are all facing forward, of course…towards the speaker, not towards each other. Therefore, at best, one could hope to relate to what the speaker was talking about, but no real connections were formed with one another. Women’s Ministry Directors continued to see lack of connections between the attendees and subsequently felt that they needed to hire a more expensive, ‘inspirational speaker’ next year in order to get women to connect with one another. But that wasn’t their problem. The true problem is they are using the wrong format to make that happen. Group’s solution was to provide a retreat kit that not only saved the expense of a costly speaker, but more importantly was designed to create intentional interactions between women by focusing on the dialogue between women, not on the speaker. Group understood that even a perfect product would not do anything unless they started ‘unteaching’ what women had learned and thought for years about how retreats should be done. Following is one of the initial marketing pieces designed to get women thinking differently about the retreats they have been doing for years. Not only did the marketing team see a 94% improvement in response rates, but the Group Sales Consultants were inundated with immediate responses and repeated references to the marketing pieces themselves. This led to a 91% sales increase over prior year. In fact, Women’s Ministry Directors were even calling Group to get more copies of the direct mail piece to use as invitations after they purchased the Group Retreat Kit. The campaign was followed up by matching the website to the style and messaging of the direct mail piece. Is it a perfect Challenger marketing piece? 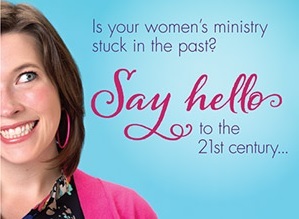 Probably not, but it challenged the status quo in a way that women in ministry could relate to, so I would call that a success. The following link (Challenger Choreography) will provide you with a great visual resource that I developed for my sales teams based on the Challenger Sales choreography. This will not only visually illustrate rep’s natural tendency to talk about products with their features and benefits, but also aids in identifying where teaching versus listening and asking questions takes place.